The Milky Way galaxy—our home galaxy—is a grand assemblage of over one-hundred billion stars that spans one-hundred thousand light-years across space. But that isn't all that there is in our galaxy. Enormous clouds of gad and dust float in between the stars; this is called the interstellar medium. Mapping the Milky Way and understanding its size and composition was made possible by advances in astronomy. Techniques such as stellar parallax and the use of a class of stars known as Cepheid variable stars made it possible for astronomers to measure vast distances across space. Despite this it was still very difficult to make some long-range distance measurements across the galaxy because the interstellar medium blocks out so much visible light; the advent of infrared astronomy, however, circumvented this issue and made it possible for 20th century astronomers to determine the size of the Milky Way. Artist's depiction of the Milky Way Galaxy. We live in an "island universe" called the Milky Way Galaxy. At the center of our galaxy, there is a supermassive black hole billions of times more massive than our Sun; the gravity nearby this black hole is so stupendous that stars—only 1,000 astronomical units away—circle around the black hole once every 20 years. Hundreds of globular clusters are bunched together to form a ball around the center of the galaxy; this is why if you look at a picture of the Milky Way edge on, you'll see a big bulge and bump (called the central bulge) in its center. Every one of these globular clusters are clumps of densely packed stars, some containing up to a million stars. Moving away from the center just a little bit, two flat rod-shaped strands—each made up of myriad stars—extend away from the central bulge. All of the stars we have talked about up to this point are old and red. But two spiral arms of young, blue stars branch off from the ends of these strands as shown in the artist's depiction of our Milky Way above. These spiral arms are stellar traffic jams: all of the stars in each spiral arm are stuck at a "cosmic red light" and can't move forward. Since the spiral arms are densely packed with myriad massive stars, they exert a tremendous amount of gravity. Any star trying to pass by one of these spiral arms will get pulled back by gravity: that star will have to wait at the red light like everyone else. This is why the space in between the spiral arms is very empty. So far, we have accounted for the vast majority of the stars that comprise our galaxy. But there's also a lot of other "stuff" in our galaxy. 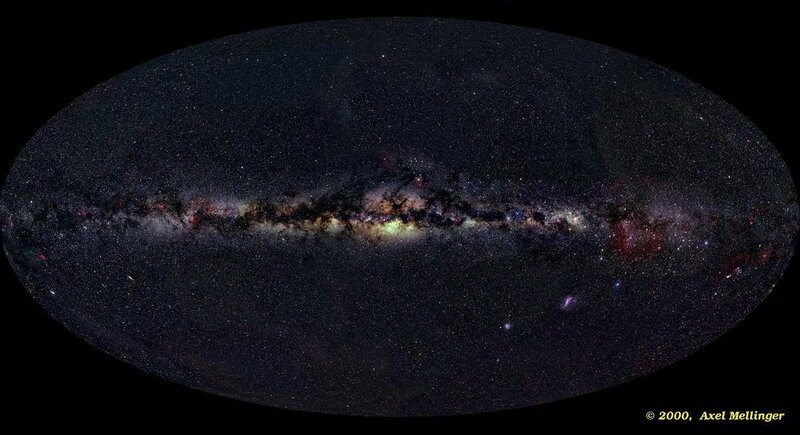 Picture of the Milky Way Galaxy as seen edge on. Our galaxy is very big and has a lot of stars. In the space that is in between all of those stars, a thin film of materials (made of mostly gas, dust and nebulae) called the interstellar medium permeates throughout the whole Milky Way galaxy. If you look at the Milky Way edge on through a telescope (see image above), you'll see that there are black spots blotched throughout the starry background. These are spots where the interstellar medium is very dense; the black patches are spots where the interstellar medium is so dense that dust completely blocks the light emitted by stars behind the interstellar medium, making them invisible. Luckily, infrared astronomy was invented in the 19th century giving us a way to get around this problem. The dust in the interstellar medium absorbs and scatters bluer light (which is to say, shorter wavelength light); redder, longer wavelength light has a much better chance of getting through. There is so much dust surrounding the middle of our galaxy that all of the visible light emitted by stars behind it gets blocked out; all of those stars are invisible when using visible light. But when we gaze towards the galactic center using the inferred spectrum, all of those previously invisible stars are clearly distinguishable as you can see from the inferred image on the right. These dense regions of the interstellar medium not only block our view of stars behind them, but they are also the places where stars and planets are born. All of the gas and dust is attracted to each other by gravity and gradually gets pulled towards each other making these dense sections get even denser through time. As gravitational forces pull everything inwards, the potential energy of all that gas and dust gets converted into kinetic energy increasing there temperature and pressure. This continues to happen until eventually the gas and dust gets so hot and dense that a star is formed. Interstellar nebulae are thus the birth places of new stars. But this is not the only way stars are formed. A star can also be forged through the collision of two neutron stars. Just imagine, somewhere out there, there are two neutron stars, separated by a distance of 3 light seconds (smaller than the diameter of the Sun), that circle each other at a fantastic speed about once every 7.75 hours. These stars will one day collide and birth a new star. The Milky Way is like a living ecosystem where stars continually die and new stars are born. Many of those interstellar nebulae are extremely active with star formation. Many of the dense nebulae making up the interstellar medium are made up of not just dust but are also strewn with gases such as hydrogen, oxygen, neon, and many others. The hot young stars birthed in these stellar nurseries (and yes, that's the technical name) emit highly energetic photons which excite the electrons of the gaseous atoms. But those excited atoms eventually settle down and transition to a lower energy level. When this happens, they emit a wide range of different colored light leading to some of the most breathtaking sights in the universe. 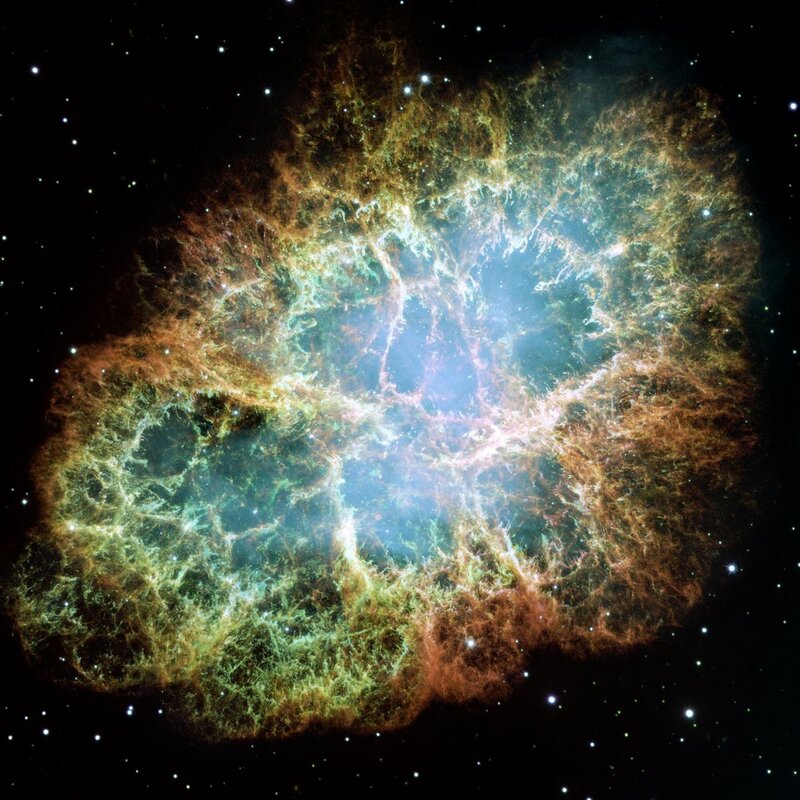 The Crab Nebula (shown in the image on the right) is one such nebula; all of the different colors you see in this image are due to all the different kinds of gaseous elements dropping to lower energy levels, emitting light in the process. When it comes to measuring distances to the nearest stars and galaxies, there are essentially two different techniques that astronomers use to determine how far away they are: the first is called parallax and the second involves using a special class of variable stars called Cepheid variables (or simply just Cepheids for short). If you are driving in a car, a tree that you pass by will appear to have moved. Similarly, if you hold out your finger at arms length (without moving it), try doing the following: while looking at your finger using only your right eye with your left eye closed, open up your left eye and then close your right eye. In both of these examples, the object you were viewing will have had appeared to move because you were observing it from two different locations. That's all parallax is: the apparent motion of an object due to observing at different locations. Indeed, this is why distant stars and galaxies in the night sky appear to move. As the Earth rotates and, also, as it moves around the Sun, the telescope that you are using to observe those objects changes from one location to another. This technique works very well for determining the distances away from us of stellar or galactic objects that are "nearby." I use the phrasing "nearby" in quotation marks since, for our purposes, nearby means tens or hundreds of lightyears away. Given today's present state of technology, any objects located more than about 500 lightyears away from us, we cannot accurately use this method to determine there distance away from us. If paralax was the only technique we had available to us to determine how far away stellar or galactic ojects are away from us, then it would have had been impossible to determine the size of our galaxy, how far other galaxies are away from us, and many other long-range distance measurements. This video was produced by the Khan Academy. The Milky Way Galaxy is an assemblage of hundreds of billions of stars that stretch 100,000 light-years across space. It is shaped like a flat disk with a slight bulge in the center. Imagine that you drew an imaginary plane through the thin width of this disk; that plane is called the galactic plane. The vast majority of the interstellar medium resides on this plane and this is why it is difficult to see much of the galaxy using visible light. But if you imagine looking up out of the galaxy where there is very little interstellar medium, you would have an unobstructed view of the universe. Indeed, the globular clusters at the galactic center are bulging out above the galactic plane enough to clearly distinguish them using visible light. Among all the tens of thousands and even sometimes millions of stars bunched together in those clusters, some of them belong to a special class of stars known as Cepheid variable stars. What is very nice about Cepheid variable stars is that we can very accurately determine how far away they are from us, and these Cepheids are clearly distinguishable since they are not blocked out by the interstellar medium. A scientist named Harlow Shapely spotted a Cepheid in one of the globular clusters in the galactic center. From the Cepheid's brightness, luminosity and period he was able to estimate that our solar system—far from the center of the universe (which was just the Milky Way at the time)—is roughly 25,000 light-years from the marvelous middle of the Milky Way. As Carl Sagan once said, this moment in human history was the next in a series of "great demotions." At first, it was the Earth which was displaced from the center of the universe and now it was our Sun as well. Then people began to argue, "well at least our galaxyy is at the center." But experimental science would eventually demonstrate that there is no center in the universe and our galaxy is just one among trillions. Even more astonishing, our entire universe is perhaps just one among countless others in a much grander multiverse!